Alfredo Jaar’s The Sound of Silence (2006) consists of a video projection booth that invites visitors to enter. The projection is devoted to the life of a photojournalist and, more specifically, to one of his famous photographs. The piece’s construction of space contextualizes the photograph, while the theatrical character of the device transforms the installation into a site for reflecting on the production of images. The Sound of Silence was first commissioned and exhibited by FotoFest, Houston, Texas. Alfredo Jaar was born in 1956 in Santiago, Chile. Alfredo Jaar combines the medium of photography with devices as diverse as posters, light boxes, large-scale installations, and projec- tion rooms that appear anonymously in urban spaces or museums. With Rushes (New York, 1986), he embarked on a process that has resulted in nearly 50 site-specific installations being set down squarely and abruptly in the most ordinary urban spaces. Jaar works by accumulating texts and photographs that freely question viewers, leaving them the responsibility for interpretation. In the form of personal investigations conducted over three decades, his work deals head-on with current North–South relations. Ranging from gold prospectors in Amazonia to the genocide in Rwanda (The Rwanda Project, 1994–2000), and from the city of Santiago under the dictatorship of Pinochet (Studies of Happiness, 1979–81) to press clippings (Untitled (Newsweek), 1994), Jaar has borrowed from the documentary tradition to express his political and social concerns. He has also, however, moved away from the visual strategies of photojournalism toward the use of elaborate staged events that draw upon art, advertising, cinema, and architecture. Beginning with Out of Balance (1986), his photographs have became one with their means of presentation, which dovetail with representation and call into question various ways of portraying and commenting on the real. Jaar designs unique spaces, such as the projection booth in Sound of Silence (2006). Calling for a new critical reading of images, his works are necessarily distanced from the continuous conversion of events into media events. Alfredo Jaarh as participated in the Venice Biennale (1986, 2007) and Documenta (Kassel, 1987, 2002), and has had a number of solo exhibitions (La Politique des images, MCBA, Lausanne, 2006) and a retrospective (This Is Difficult, Hangar Bicocca, Milan, 2008–09). Alfredo Jaar, The Sound of Silence, 2006. 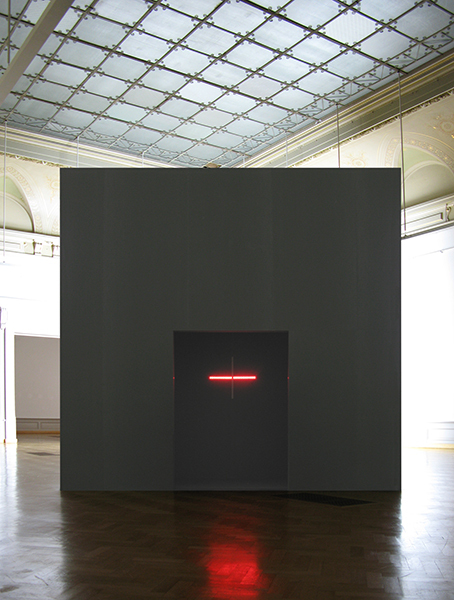 Installation view, Musée cantonal des Beaux-Arts, Lausanne, 2007. Courtesy of the artist.